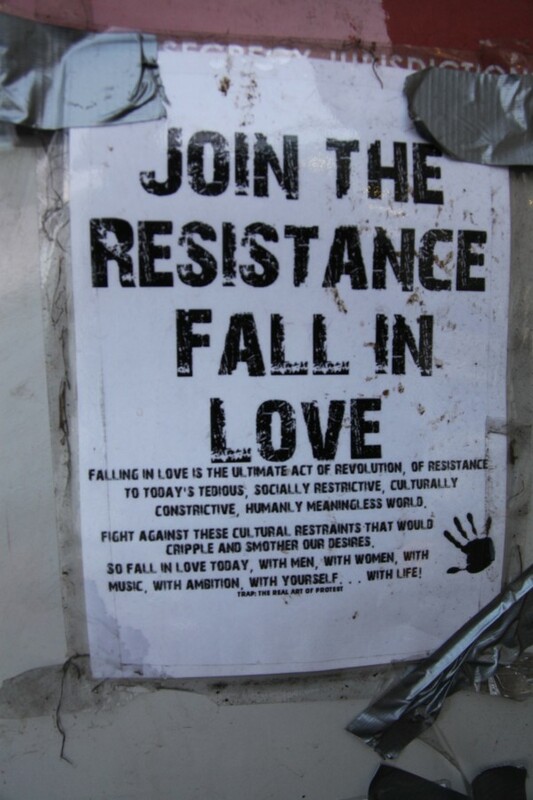 Falling in love is the ultimate act of revolution, of resistance to today's tedious, socially restrictive, culturally constrictive, humanly meaningless world. Love transforms the world. Where the lover formerly felt boredom, he now feels passion. Where she once was complacent, she now is excited and compelled to self-asserting action. The world which once seemed empty and tiresome becomes filled with meaning, filled with risks and rewards, with majesty and danger. Life for the lover is a gift, an adventure with the highest possible stakes; every moment is memorable, heartbreaking in its fleeting beauty. When he falls in love, a man who once felt disoriented, alienated, and confused will know exactly what he wants. Suddenly his existence will make sense to him; suddenly it becomes valuable, even glorious and noble, to him. Burning passion is an antidote that will cure the worst cases of despair and resigned obedience. Love makes it possible for individuals to connect to others in a meaningful way—it impels them to leave their shells and risk being honest and spontaneous together, to come to know each other in profound ways. Thus love makes it possible for them to care about each other genuinely, rather than at the end of the gun of Christian doctrine. But at the same time, it plucks the lover out of the routines of everyday life and separates her from other human beings. She will feel a million miles away from the herd of humanity, living as she is in a world entirely different from theirs. In this sense love is subversive, because it poses a threat to the established order of our modern lives. The boring rituals of workday productivity and socialized etiquette will no longer mean anything to a man who has fallen in love, for there are more important forces guiding him than mere inertia and deference to tradition. Marketing strategies that depend upon apathy or insecurity to sell the products that keep the economy running as it does will have no effect upon him. Entertainment designed for passive consumption, which depends upon exhaustion or cynicism in the viewer, will not interest him. There is no place for the passionate, romantic lover in today's world, business or private. For he can see that it might be more worthwhile to hitchhike to Alaska (or to sit in the park and watch the clouds sail by) with his sweetheart than to study for his calculus exam or sell real estate, and if he decides that it is, he will have the courage to do it rather than be tormented by unsatisfied longing. He knows that breaking into a cemetery and making love under the stars will make for a much more memorable night than watching television ever could. So love poses a threat to our consumer-driven economy, which depends upon consumption of (largely useless) products and the labor that this consumption necessitates to perpetuate itself. 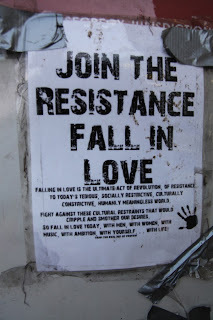 Similarly, love poses a threat to our political system, for it is difficult to convince a man who has a lot to live for in his personal relationships to be willing to fight and die for an abstraction such as the state; for that matter, it may be difficult to convince him to even pay taxes. It poses a threat to cultures of all kinds, for when human beings are given wisdom and valor by true love they will not be held back by traditions or customs which are irrelevant to the feelings that guide them. Love even poses a threat to our society itself. Passionate love is ignored and feared by the bourgeoisie, for it poses a great danger to the stability and pretense they covet. Love permits no lies, no falsehoods, not even any polite half-truths, but lays all emotions bare and reveals secrets which domesticated men and women cannot bear. You cannot lie with your emotional and sexual response; situations or ideas will excite or repel you whether you like it or not, whether it is polite or not, whether it is advisable or not. One cannot be a lover and a (dreadfully) responsible, (dreadfully) respectable member of today's society at the same time; for love will impel you to do things which are not "responsible" or "respectable." True love is irresponsible, irrepressible, rebellious, scornful of cowardice, dangerous to the lover and everyone around her, for it serves one master alone: the passion that makes the human heart beat faster. It disdains anything else, be it self-preservation, obedience, or shame. Love urges men and women to heroism, and to antiheroism—to indefensible acts that need no defense for the one who loves. Thus she does indeed pose quite a threat to our society. What if everyone decided right and wrong for themselves, without any regard for conventional morality? What if everyone did whatever they wanted to, with the courage to face any consequences? What if everyone feared loveless, lifeless monotony more than they fear taking risks, more than they fear being hungry or cold or in danger? What if everyone set down their "responsibilities" and "common sense," and dared to pursue their wildest dreams, to set the stakes high and live each day as if it were the last? Think what a place the world would be! Certainly it would be different than it is now—and it is quite a truism that people from the "mainstream," the simultaneous keepers and victims of the status quo, fear change. And so, despite the stereotyped images used in the media to sell toothpaste and honeymoon suites, genuine passionate love is discouraged in our culture. Being "carried away by your emotions" is frowned upon; instead we are raised to always be on our guard lest our hearts lead us astray. Rather than being encouraged to have the courage to face the consequences of risks taken in pursuit of our hearts' desires, we are counseled not to take risks at all, to be "responsible." And love itself is regulated. Men must not fall in love with other men, nor women with other women, nor individuals from different ethnic backgrounds with each other, or else the usual bigots who form the front-line offensive in the assault of modern Western culture upon the individual will step in. Men and women who have already entered into a legal/religious contract with each other are not to fall in love with anyone else, even if they no longer feel any passion for their marital partner. Love as most of us know it today is a carefully prescribed and preordained ritual, something that happens on Friday nights in expensive movie theaters and restaurants, something that fills the pockets of the shareholders in the entertainment industries without preventing workers from showing up to the office on time and ready to reroute phone calls all day long. This regulated, commercial "love" is nothing like the passionate, burning love that consumes the genuine lover. These restrictions, expectations, and regulations smother true love; for love is a wild flower that can never grow within the confines prepared for it but only appears where it is least expected. We must fight against these cultural restraints that would cripple and smother our desires. For it is love that gives meaning to life, desire that makes it possible for us to make sense of our existence and find purpose in our lives. Without these, there is no way for us to determine how to live our lives, except to submit to some authority, to some god, master or doctrine that will tell us what to do and how to do it without ever giving us the satisfaction that self-determination does. So fall in love today, with men, with women, with music, with ambition, with yourself. . . with life! One might say that it is ridiculous to implore others to fall in love—one either falls in love or one does not, it is not a choice that can be made consciously. Emotions do not follow the instructions of the rational mind. But the environment in which we must live out our lives has a great influence on our emotions, and we can make rational decisions that will affect this environment. It should be possible to work to change an environment that is hostile to love into an environment that will encourage it. Our task must be to engineer our world so that it is a world in which people can and do fall in love, and thus to reconstitute human beings so that we will be ready for the "revolution" spoken of in these pages—so that we will be able to find meaning and happiness in our lives.